THE BROTHER OF one of the victims of the Carrickmines halting site fire in 2015 today told an inquest that he found his brother’s body in the bedroom during the blaze but was unable to lift him to get him out. 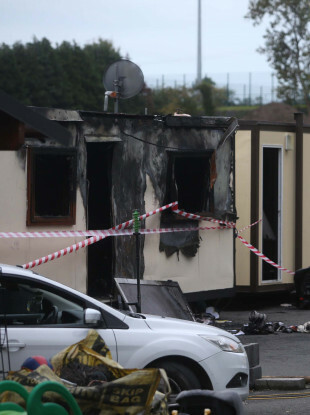 John Keith Connors was just 14 the time of the fire at Glenamuck halting site in Carrickmines, Dublin 24 in the early hours of 10 October 2015. Today he told the Dublin Coroners Court that he entered his brother’s home through a broken window in an attempt to rescue people from the fire. He did manage to get his four-year-old nephew, who survived the tragedy, out through the window, but he said he was unable to lift his brother Thomas Connors or his sister-in-law. The victims of fire were Thomas Connors (28) his wife Sylvia (30) and their children Jim (5), Christy (3), and five-month-old Mary. Willie Lynch (25) and his partner Tara Gilbert (27) who was pregnant, and their daughters Jodie (9) and Kelsey (4) also perished. Jimmy Lynch (39), Sylvia and Willie’s brother, also died in the blaze. Members of the Lynch family had been visiting the Connors and were staying with Thomas and Sylvia. At the Dublin Coroner’s Court this morning, Jim Connors Jr, the brother of victim Thomas Connors said he had been at his brother’s home that night drinking with the other adults. Later, back at his own cabin on the site, he said he was woken by his wife Katie who was screaming at him to come to Thomas’ home because it was on fire. “I could see the flames from my back door,” he said. He ran to his brother’s home and kicked in the front door, but he said he “got hit by the flames”. I could feel myself burning so I came back out. He grabbed a wooden pallet to use as a ladder and he reached in the window of one of the bedrooms. “I grabbed a child by clothes and just reached backwards out of window,” he said. This child was baby Mary Connors, who was five months old. His sister Kathleen Connors McDonagh described being handed the baby, wrapped in a pink blanket, and running to her own unit. She placed the baby on the bed next to one of her own children and told him to mind her and then ran back to see if she could get any of the other children who had been staying with her brother that night. “When she was handed to me, I didn’t know if she was dead or alive,” she told the coroner. To me she was alive because I told the child to look after her. I was handed a pink blanket and I just ran with it. Before she even made it back to the other unit where the fire was, her four-year-old son called to her from the steps of her home. She looked back and said she saw smoke coming from her front door. The fire had spread into her home, which was close to the Connors’ unit. She tried to get back in to get the baby out, but by this time Dublin Fire Brigade had arrived and they entered instead. Her sister-in-law Katie Connors, who is Jim Jr’s wife, said she was the one who handed the baby to Kathleen. She said when baby Mary was first taken out of the bedroom, she was breathing noisily. “We were really trying our best trying to get in the window and everything, trying to get anyone out,” she told the coroner. The jury also heard how 14-year-old John Keith Connors went in and pulled then four-year-old Tom Connors – who survived – out of the unit that was on fire. John said he held his breath and had to keep his eyes closed because of the smoke when he climbed in the bedroom window. At this stage the flames were in the hallway. He said he was given a fire extinguisher, but that it didn’t work when he pressed the handle. He insisted he had pulled the pin out and that it felt full as it was heavy. Coroner Dr Myra Cullinane had earlier heard garda evidence that four functioning fire extinguishers were found around the site after the fire. Two were found close to the unit where the blaze started. None of the cylinders had their pins removed and none indicated a loss in pressure, according to the designated garda exhibits officer. John said he tried to catch his breath out the window a few times, but he realised if he went back in he may not make it back out. Back in the yard, he picked up four-year-old Tom in his arms. He called emergency services as he walked with the child out to the road. “I was roaring down the phone,” he said. This was not the first time services had been called about the fire and when he got to the road members of Dublin Fire Brigade soon arrived and took the boy from him for treatment. Over the first two days of the inquest there has been conflicting evidence from family members and council executives and contractors about whether there was electrical work on Thomas Connors’ unit on 9 October 2015, the day before the fire. A number of family members said they had either been told by Thomas about workers at his home or had seen people doing work at his home that day. Today Dun Laoghaire-Rathdown County Council’s director of housing and community Tom McHugh told the coroner that there is no evidence from caretakers, electrical contractors or invoices of any service work being carried out that day. When questioned by the council’s legal representation about why they had never mentioned this electrical work to gardaí in their statements, family members said they gardaí did not ask them about whether any work had been done in the days before the fire. On the first day of the inquest yesterday, Garda Detective Inspector Martin Creighton told the jury that the probable cause of the fire was determined to be an electric cooker in the kitchen of the Connors home which had a chip pan on it. He said the pan was on a hot plate which was on full power. The inquest continues tomorrow with evidence from first responders including paramedics, members of Dublin Fire Brigade and gardaí who were first on the scene. Email “Carrickmines rescue attempts: 'I found Sylvia and Thomas but I couldn't lift them'”. Feedback on “Carrickmines rescue attempts: 'I found Sylvia and Thomas but I couldn't lift them'”.